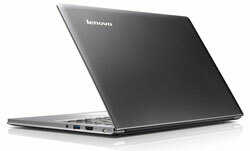 I am presently on unemployment but would love to be able to supply my daughter, a single mom, with a Lenovo Ultrabook. She recently applied for divorce and will have very few resources. Her 2 children (2 and 6) love to go to their favorite educational games and she needs one to keep connected to the outside world while bringing up these two kids on her own. Her present laptop is 8 years old and has had a known Dell issue with not charging and cannot be repaired - very frustrating and unreliable. I would love to win this because my Son and his wife have 4 children and only a desktop, this would help them so very much! It sounds like an awesome product , sadly I am not in a financial position to purchase one ! my current laptop has next to no battery life so it’s practically a desktop! I should win the Ultrabook because . . . I have 2 college students in my household. They do research, homework, college communication, email, scholarships and more on the computer. The benefits of winning the Ultrabook would ENDLESS! I have been working on the MacOS platform for many years. However, I now want to become more Microsoft platform literate as I believe that one needs to be familiar with both systems. My HP is 17” an over 7 years old, it weighs at least 9 lbs. I am getting older, have to travel more for health reasons and really need a lighter laptop. Hardly can get thru the airport or up the stairs with my old one. Winning this would mean that I would not have to share with the kiddies anymore!! Don’t get me wrong, love them all but I have a better shot at finding the bathroon free (3 girls in the house! )than the computer!! I need a new computer because my old one is about as slow as dialup !!!!!! It’s old and tired. This would bring me up to date with the latest and greatest of computers-LENOVO!!!!! Please help!!! Thanks. My husband and son always want to use (steal) my computer so if I got this one they could have my old one and we’d both be happy. Plus, I like to take my computer with me everywhere I go but the one I have now is soooooo cumbersome that it’s like taking an extra piece of luggage. This tiny, powerful computer would solve both my problems. This couldn't be better timing. This couldn’t be better timing. My 10 year old Dell laptop has finally died and I need to replace it. Winning this Lenovo would be perfect for me as it will not only replace my dead laptop but will also finally catch me up to modern computing. I’m looking for a powerful but lightweight and stylish laptop for work and home. I have been looking into 13 inch systems for some time and am intrigued with one that has a real processor. Our family’s laptop is so slow and the battery will not stay charged…been looking for a smaller more portable laptop to replace the dinosaur!! That’s how many old laptops float around our house and non work and they have all been donated by me from my business to my family after we upgrade employees. Missing keys, cracked screens, you name it. My wife deserves it! She doesn’t like her netbook, and the PC in the basement is nearly 10 years old. This will make it easier to Skype with our infant grandson. I’ve been blessed to have a very flexible job that allows me to work from home when I need to. My personal laptop had died, so a new one is desperately needed. I need a new Intel-powered Ultrabook because my old desktop keeps freezing up with lines all over my old monitor. And I just can’t seem to manage taking the desktop with me when I leave the…desk. Thanks for the chance! My husband desperately needs a new computer but we just can’t swing the expense right now. I would win wife of the year if I could give him this as a gift (and it wouldn’t hurt that I could use it too)! Need a Valentine's gift for my hubby! i have a ridiculas amount of computers, which rarely get used.. why not add another to the lot. I need a new computer because I’ll be reentering the workforce this year and my old laptop is not going to be able to keep up! my computer is several years old and my kids are always fighting over it with me. I need my own computer for me and me only. My son will be moving away to college and this will not only help him with his studies, but it will help us keep in touch with him (and help avoid the empty nest syndrome for his Mom!). I take the train to work everyday. Not that is so strange, but it is fairly unique in Austin Texas. It began when I was unemployed and our 2nd car died. I was cutting every corner of our expenses and at the same time taking a hard look at our green footprint. So now that I am “green”, I am bored. The train offers free wifi, but that doesn’t help when there is no laptop! I could be so more productive and social while I commute to my new job! So I want to get one for her. She uses the laptop to communicate with her Dad’s doctors/nurses about his Parkinson’s. I need a Lenovia Ultrabook so I don’t have to share computer time with everyone in the house. Would be great to take with me for training in the Army Reserve. I need a new laptop because a new battery for mine costs almost as much as my laptop is worth. I need a new Ultrabook because my current computer is now 6 years old, and lagging quite a bit! I need a laptop/portable device because I’m starting my own business this year doing taxes sms it would be great to be more mobile. I need the laptop so that I can have adequate functionality editing my photos and projects. My laptop spent 2 tours in Iraq and it definitely needs a rest. I need one because. . .
. . . Because our desktop is limping along at almost 6 years old and my teenager needs a computer for school work. I’ve bought two laptops in the last three years - for my two college age children because they are practically required in college - but doesn’t leave much in the way of funds for one at home! I bought a toshiba about a year ago. I think it has seperation anxiety as its been back to Toshiba 3 times in the year to get a new hard drive. I work from home, but sometimes need to get out and about and my laptop is too much to bother with. It would be great to have something new and sleek to show off! I would love to have one for myself. I have an old Dell that works fine for me however a newer laptop that is lighter and faster would be greatly appreciated. While I don’t actually NEED a new laptop if I would happen to win I would probably give this to my neice who will be attending college in the fall of 2012! Our second computer is gathering dust… it’s so oooold it has a CRT monitor and no one wants to sit at it. .....and that is what I have! It’s faster for me to look up information in a phonebook that for me to logon and look it up online! Faster for me to call some one than to message them! Working from home (in order to stay home with the kids) is great, unfortunately one income makes it a little tough to get the things we want most. In a one income family it’s a matter of what we need and not what we want. I have not been able to find a job for over 3 years and could really use a new pc to continue job searching! I’d love a new Lonovo simply because it’s an awesome Ultrabook and easy to handle. I have arthritis in my hands and the weight of a regular lap top is almost too much at times. I need a new Intel-powered Ultrabook because I will be attending the University of Houston soon and it would really come in handy! I’d like a new computer so I can take it to travel easily. Lenovo Ultrabook because at 48 I’m going back to college and all I have is a 6 year old pc. Need to replace the worthless piece of junk netbook he bought to travel with. I have no laptop and really need one. How nice it would be to have a great one like this! I have an antique laptop that my DAUGHTER gave me after she used it during her college years. The audio doesn’t work and some of the keys are damaged. Time to upgrade! Thanks for the chance.